In June 2010, more than 6,000 SmartBrief readers participated in a benchmarking study of social-media usage by business. The results revealed a portrait of how these new tools and platforms are changing the way companies do business and how they are integrating social media into their business models. About half of the companies in the sample have been using social media for only the past year, with nearly 20% starting in the past 13 to 18 months. The concentration on “the big 5” hints at companies being able to find their customers on these sites. With lower awareness and/or usage of other sites, including platforms such as Flickr with large numbers of users, companies might be missing out on more niche groups. More than 25% of companies with two-plus years of social-media activity state that those tools and platforms have been fully integrated into their companies’ business models. 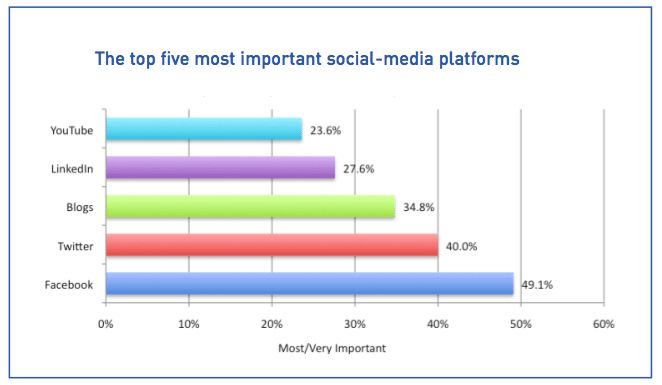 In addition, more than 50% have a well-developed or fully developed social- media strategy, which is further evidenced by the use of multiple platforms. Despite the primary goals of increasing brand awareness and building communities for customers and fans, the majority of companies surveyed use social media to broadcast information instead of creating two-way conversations. Communications and PR agencies recognized the potential behind social media earlier than most industries. Likewise, advertising and marketing firms have realized the potential of identifying and reaching target audiences relatively early as compared with other industries. One-third of the respondents note they are not decision makers. Combined with the 14.7% citing management resistance, this indicates an overall lack of management support. In addition, 33.1% cite confidentiality issues as a primary obstacle. Taken together with the prohibition of social-network use at work, the data show that many companies are concerned about how their staff would use these sites. Connecting social media efforts to bottom-line results is a skill that escapes most businesses that are using social media. Less than 15% of the businesses in the sample using social media reported that they are measuring their return on investment while over 33% are not measuring return on investment at all. Companies are critical of their social-media strategies, with only 14.2% describing their strategies as “very effective” and only 7.3% describing them as “very revenue generating” on average.